Valentine's Day is right around the corner and regardless of your relationship status, everyone can celebrate Valentine's Day...with the right outfit. Since the actual day is on a Sunday this year, most people won't celebrate it while in the office, so this allows for a lot more casual outfits to make an appearance. I love this sweet chambray + floral pairing. It's reminiscent of Vday without being over the top. Pink is one of my fave colors to wear on Vday. 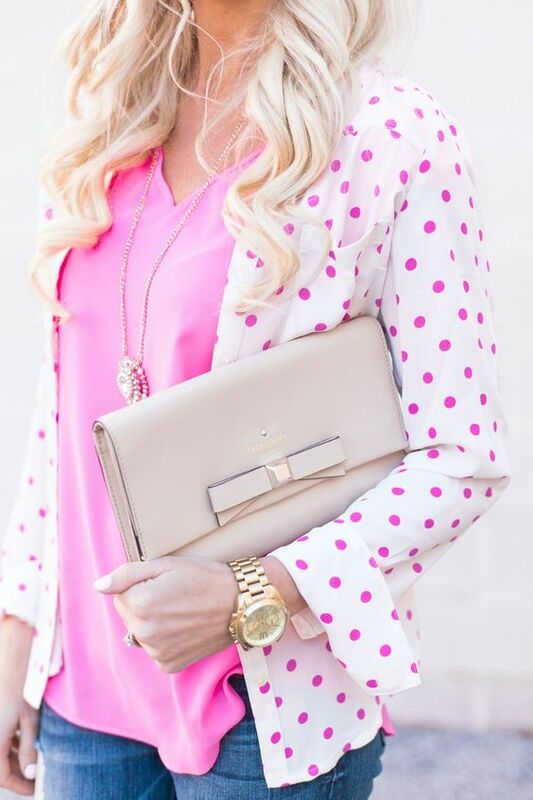 This pink polka dot look is just whimsical enough for Vday without being too kitsch. I totally love those red boots! If you have red boots, you MUST wear them on Vday. A slouchy tunic sweater makes this look casual instead of super fancy. I love, love, love those mittens! The furry vest is the right amount of texture for an otherwise basic outfit. This would be just perfect for lounging but also for a casual date. I love the pop of dark red in the scarf! Would you try any of these looks for Valentine's Day? I like to wear red and pink together, it's like the only time it's encouraged. I don't know if I'll pull it off this year. I might do black, pink, and white.